Meet Henry March. 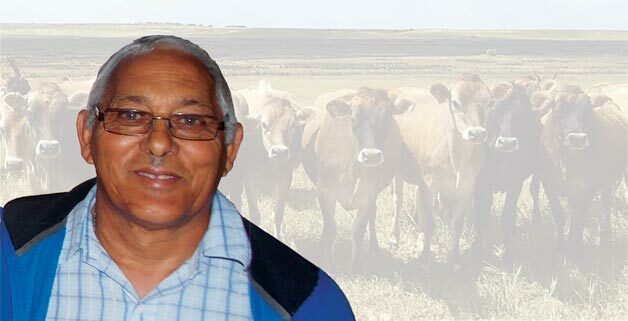 Henry is a developing farmer who farms with grain and livestock on Theewatersvlei farm, Hopefield in the Western Cape. This passionate farmer believes if you grow up on a farm your heart will always be on the farm. The farm Theewatervlei is 1 176 hectares and was bought with a loan from Land Bank in 1994. Theewatersvlei is run by a group of four members representing four families. There are two main enterprises on the farm which are grain production (wheat, barley, lupines and oats) and livestock production (sheep and cattle). If you grew up on a farm, your heart will always be on a farm. To create job opportunities for the community of Hopefield motivates me. I also want to optimally utilise the land and other natural resources available. I am also motivated to farm on commercial level. My strengths entail mechanical, fitting and electrical interests and I try to be a good manager. I feel that a weakness of our business is that we do not yet have all the equipment needed to produce grain as well as we know we can, but we are growing slowly but surely and will be able to start acquiring some of our own equipment soon. My yields when I started farming were very poor, approximately 0,5 tons/ha. Now my average yields are 2,2 tons/ha. I can attribute my progress and success to hard work and learning from my mistakes. We also recently started working with a very good mentor and are very excited about the road ahead. To date I have received a lot of pig, cattle, and sheep training. I would still like to learn more about wheat planting and how to prepare the soil. Training has been scheduled for record-keeping and grain production (wheat). In five years time I would like to farm independently, to increase production of cash crops and to optimise the animal production unit. First of all, your whole heart must be in farming because it requires hard work, good planning and a lot of patience. Secondly, it is important to remember that you will not get rich in a month!